Cornette Library Prototype - CIS 4372 HCI and Data Viz. 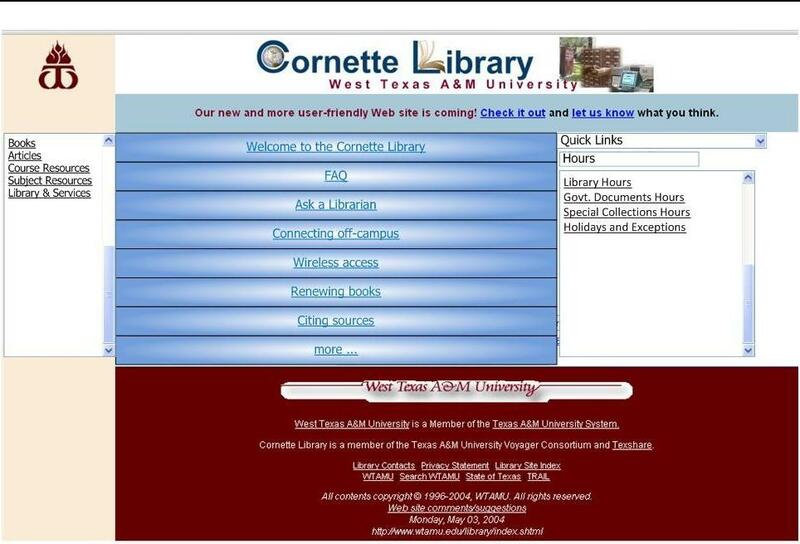 Initial requirements for the Cornette Library website might have included, but not limited to, displaying availability of library books and resources, account accessibility, hours of operation, contact information, University links, answers to frequently asked questions, and a site index. Once the initial layout of the website was constructed, a sample of students and other end users could have been selected to test the usability of the prototype. Feedback from those individuals or informants would have indicated what worked well and what needed to be revised. The next stage would be to produce a final version based on the participatory testing. The implementation of the Cornette Library website would then be available to all web users. Any future issues could also have been iterated after the implementation because maintaining a website such as this could be done with relatively low costs and short downtime. This prototype might have been temporarily on-line and students and other individuals could have been observed accessing the site in the Cornette Library. Those end users could have also provided feedback to qualitative and quantitative inquires. For the most part, students would be the main users of the Cornette Library website. It would have not been unreasonable for a CIS student to be a part of the design process. His actual participation would have been helpful in catering the design to other students and the faculty that would use it. Another participant could have been one of the individuals involved in the design process of the Texas A&M Library website. A scenario could have been produced for approval from the Department Head before the prototype was designed. Such a scenario could have been a student who was looking for a required book for one of his classes. The student would log into his account and query the title of the book based on the author’s last name. If the book was available the system would give the location of the book and a link to a library floor plan next to it. At the time the book was due the student would be able to log into that account under which he checked the book out and see a list of all books checked out. On the screen would be an option to renew the book online without ever having to revisit the library. Another scenario could be that an undergraduate student is searching for review answers before a test with only a two hour period left to study. Because of the links and important information being in easy places to see and access he is able to find the sources quickly and get the information he needs efficiently in time to study for the big exam. In this scenario development the student was able to find what he needed because of logs kept for keeping track of student activities, the website developers were able design the site so that the most used links and tools were quickly and easily available.